Victoria Eugenia Henao was the wife of notorious Columbian drug lord Pablo Escobar. As his widow and mother of his children, she has lived a life of both luxury and misery. Here are 15 facts about what it was like to live alongside one of the world’s most dangerous men. Victoria was only 15 years old when she married Escobar, her self-proclaimed soulmate in March 1976. He was 11 years her senior and her family strongly disapproved of the union. They ended-up eloping. That’s how she described her husband. Hard to believe he would go on to become the most feared drug kingpin of his time. She claims the man who made his fortune by harming others, dreamed initially of building schools for the poor. What he apparently didn’t tell her was that he was working for various smugglers at the time and involved in kidnappings for ransom. 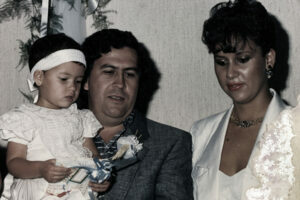 Victoria says that she got her first taste of his temper when Escobar demanded she gets an abortion. She was still in her teens, and it was against her religion. But she later claimed he“put a spell” on her. While Escobar was becoming more involved in the lucrative world of cocaine smuggling, he was also cheating on his wife. He openly had a mistress and was often seen with other women. But Victoria stood by him anyway. Some say it was because she didn’t want to leave her lavish lifestyle. She claims it was because he was the only man she ever loved. Victoria and Pablo had two children, and by all accounts, he would do anything for his family. Money was no object and he allegedly once arranged for a unicorn (which only exists in fairytales) to be made from a horse as a gift to his daughter on her birthday. He also supposedly burned a couple of million dollars in cash to keep his family warm when the electricity went out. While Victoria lived a quiet life at home, her husband was out establishing routes to smuggle cocaine into the United States. He went on to form the infamous Medellín Cartel that, at one time, supplied about 80% of the U.S. cocaine market. With his cartel bringing in a whopping 70-million-dollars a day in drug profits, Pablo Escobar became the wealthiest criminal in history with an estimated worth of $30 billion (that’s about $40 billion in today’s money). Among his many holdings was a 7,000-acre estate complete with its own private zoo. But Victoria would later claim all she cared about was her husband’s safety and wanted him to leave the deadly world of drug smuggling. Victoria wasn’t alone in supporting Escobar. He became a hero to many Columbians after he built homes, sports facilities and even distributed cash in impoverished communities. 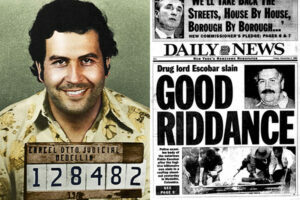 As a result, some of his countrymen helped Escobar avoid police capture by serving as lookouts. After his cartel carried out hundreds (some say thousands) of murders, the Columbian government was finally able to put Escobar behind bars. But he escaped in 1992. Victoria and her children were put under around-the-clock surveillance and she claims authorities made their life a living hell. On December 2, 1993, Escobar was shot and killed by a group of U.S. backed Columbian police officers. Escobar and his bodyguard were trying to escape via the roof of his hideout home when both died in a hail of gunfire. It’s believed authorities were able to find him after they traced a phone call he made to Victoria. In fear of retaliation from her husband’s enemies, Victoria wanted to flee Colombia. In the meantime, police raided their home and seized all of the family’s assets. Now broke and with no countries eager to take them in, Victoria began to panic as she took her kids from country to country. Since the family decided to lead a life entirely under a shadow, nothing is known about Henao’s profession and net worth. Nonetheless, her husband was considered the wealthiest criminal in history, with an estimated known net worth of $30 billion. Victoria stayed out of the spotlight until 2018 when she decided to tell her story in a book, titled My Life and My Jail with Pablo Escobar. In it, she claims rival cartels paid $220 million for her husband’s head. Her son works as an architect and lecturer. The couple’s daughter has never mentioned her father’s name in public and has cut all ties to the family.